When suffering from allergies and searching for a solution, it is easy to get lost in the overwhelming amount of information. All of the medical jargon, regional differences, and seasonal variations are hard to keep track of. In order to fully understand your symptoms, it is necessary to understand how allergens are measured. One way to measure the amount of allergens in the air is with a pollen count. Although many different allergens can cause allergic reactions, pollen is the most notorious outdoor allergen. Simply speaking, a pollen count is how much pollen there is in the air. More specifically, it is the number of grains of pollen that can be found in a single cubic meter of air. As you might imagine, the higher the pollen count is, more people who are allergic to that specific pollen will suffer and experience symptoms. The sample used to determine a pollen count is a 24-hour collection process. A silicone rod covered in a sticky grease is rotated in the air on a rooftop that is at least one story tall. Throughout the day-long collection period, the rod will be tested repeatedly for the amount of pollen that is adhered to it. After the pollen has been collected, it is taken to a lab to be analyzed. Once in the lab, the pollen will be viewed under a microscope to determine the type and amount of pollen in the air. The amount considered to be “high” varies with geographic location, time of year, and type of pollen. Thus, pollen counts are often reported as low, moderate, or high to avoid confusion over these variants. A low pollen count would affect few allergy sufferers, whereas a high count would affect most individuals who are allergic to a certain pollen. In Southern Arizona, allergies are problematic because of our hot, dry, and windy climate. Tucson has one of the longest continuous records of daily pollen counts in North America. The pollen is hard to avoid, and even affects urban and suburban residents differently. The types of pollen found in the Tucson metropolitan area differ from those in the surrounding desert. Urban Tucson has seasonal high pollen counts of cottonwood, grass, mulberry, and olive trees; whereas in the desert Ragweed and other grasses are by far the biggest culprit. Spring typically has the highest pollen count, and these high levels continue until a brief respite in monsoon season. The rains subdue the pollen and prevent it from being carried in wind and dust. The Tucson pollen count varies year by year, and sufferers should check with local data collection services for updated levels. 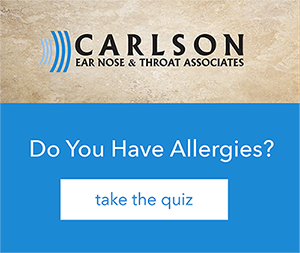 If a high pollen count is affecting you, contact Carlson ENT today and schedule an appointment with our certified Allergist. We will help you identify your specific allergies, and prescribe the best treatment to get you back to health quickly.